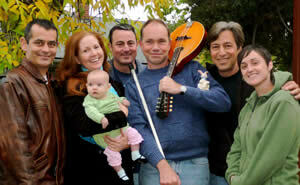 Sheldon’s music versatility and eclectic tastes create a distinct and first-rate ensemble for every occasion. Please watch the calendar for shows, or contact Sheldon directly for booking information. Beloved poems of A.A. Milne come to life with Sheldon Sands’ magical songs composed for piano, guitar, mandolin, dobro, bass, accordion and four voices. From the touching “King John’s Christmas” to the swinging title song, “Sand-Between-the-Toes,” the wonder of childhood is awakened for all who listen. From Denver’s Swallow Hill to Boulder’s Chautauqua, Sand-Between-the-Toes has been receiving rave reviews from young and old alike. With the spectacular Marta Burton and Stray Dog. Go to Discography to learn about the CD! 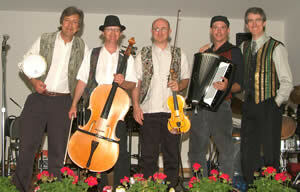 This dynamic ensemble brings to audiences the infectious spirit of the Eastern European Klezmerim, combining instrumental virtuosity, great humor and improvisation with deep respect and knowledge of Jewish musical traditions. Lead by Shmelkie Shmueli (Sheldon Sands) on keys, the original band line up consisted of Eat-Sock Manischewitz (Jesse Manno) on drums, Shlep Cellowitz (James Hoskins) on cello, Slow-Mo Fiddleman (Anthony Salvo) on violin and sax, and Doveed Barkowitz (Dave Willey) on accordion and drums. A Boulder Klezmer Consort show may include Joe Lukasik (clarinet), Sandra Wong (violin), and Eyal Rivlin (bass/guitar) and Faye Nepon (vocals) Playing at concert halls, weddings, Bar/Bat Mitzvahs and dance events throughout the Rocky Mountain region, the Boulder Klezmer Consort never ceases to delight, enrich and entertain! 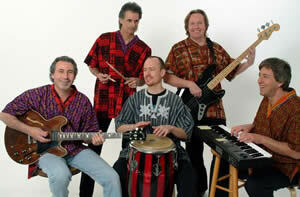 With great passion and precision, Soul Sacrifice faithfully recreates the music of Carlos Santana’s legendary band. Featuring burning renditions of Latin-infused rock classics such as “Oye Como Va,” “Black Magic Woman” and “Jingo lo ba,” Soul Sacrifice captures and delivers up the signature multi-cultural sound and spirit that is Santana. The band features Steve Glotzer on guitar, Greg Klicker on lead vocals and bass, Joe “Double Pedal Gold” on drums, Scott Parker Mast on hand percussion and Sheldon Sands on keys. "You'll think you’re seeing and hearing the real thing!" -Brian, owner, Rhumbas, Boulder CO.
A world-class musician and highly engaging entertainer, Moroccan native Rachid Halihal performs mesmerizing music from the classical Egyptian repertoire, the Arabian Gulf, the Fertile Crescent and North Africa. As a child growing up in Fez, Morocco, Rachid played the ney (Middle Eastern flute) and sang, imitating the famous singers of the time. At age fourteen he entered "Dar Aadyil" the Conservatory of Music in Fez. At first he studied Western classical and Andalus music on piano and violin. He soon expanded to other instruments to better express his native music. 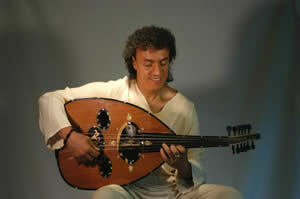 With Rachid on vocals, oud (Middle Eastern fretless lute) and violin; the ensemble includes Sheldon Sands on Middle Eastern keyboard and James Hoskins in cello. Bat Kol brings a fresh voice to ancient Hebrew mystical prayers and longings, with beautiful vocals and an infectious fusion of Western, Middle Eastern and Indian musical styles. 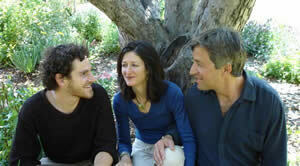 The core trio consists of vocalist Michelle Wolf, keyboardist Sheldon Sands and guitarist Eyal Rivlin, with guest musicians Steve Bross (percussion) and Sandra Wong (violin). "Bat Kol's PrayerSongs is soul music for today's spirit-seekers. These melodies go right to the heart. I recommend this disc highly." Robert Gass, EdD Best selling recording artist and author of "Chant: Discovering Spirit in Sound"